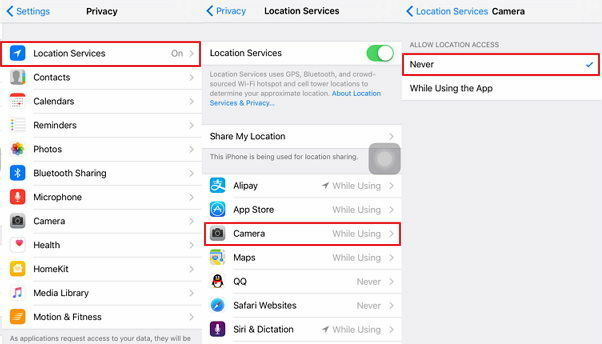 Tip: All below mentioned apps can be found in Apple App Store on your device. Photo Investigator is a free app designed for iOS devices. You can find this app on App Store, compatible with iPhone, iPad and iPad Touch. 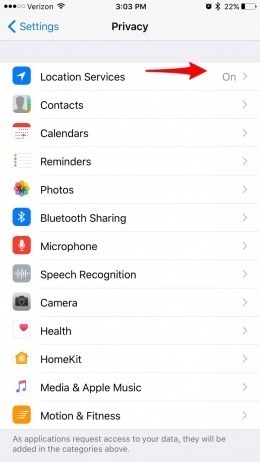 iOS 9.1 or any later version of iOS is supported by this app. If you use this app, you will be able to view any available metadata like time, location, name etc. You can edit and even remove the details of the metadata. You can find the metadata location on Apple or Google Maps. This is an excellent photo location finder app. You can even use this to extract data from messages, photos, and other apps. There is an in-app purchase available for more interesting features. This one is also a free app supported by only iOS devices which include iPhone, iPad and iPad Touch. This app is compatible with iOS 7 or later. You can use this app to view the EXIF data. The EXIF data provides a lot of information like date, location, time etc. You can visualize the map with the help of this app. You can also customize the information inside the EXIF file. As usual, this is also an excellent app that can find photo location. It is available in the App Store and it is very famous for its simple yet effective working formula. EXIF Viewer Lite is a beautifully designed app designed for professional photographers. It is the lite version of the original EXIF Viewer. This is a universal app and as the name suggests you can view and edit EXIF as well. Once you get it you can use it on all of your iOS devices like iPhone, iPad etc. This app allows you to view EXIF data and even delete EXIF data. You can even share the photo with the metadata or without metadata. You can zoom in and out of the photos for better visibility. There are also many other features available with this app along with the removal and addition of EXIF files. Good option to go for. Exif Wizard is a very commonly used Exif app that can easily translate the commonly used tags into English. It includes E-mail support. It is also a free app designed only for iOS devices. You can view the Geo-tagged map and you can zoom in on one picture at a time. Keep in mind; if you edit a photo on Photos App then you won’t be able to access that photo with Exif Wizard. It is compatible with iOS 8 or any later version of iOS. As you can see, this an exceptionally convenient app designed for professional users. Another app designed to view and edit metadata is the Exif Manager. It is available on the App Store and only supports iOS devices. It means that you can use this app on your iPhone, iPad and even iPad Touch. It is user-friendly and easy to use as well. You can easily find the time and the location of the snapped photo. All available metadata are present, you can even edit them. You can even open the location in the photo if it is available on the Maps. Exif manager is an extraordinary photo location app able to not only find the hidden data but also edit them as per your convenience. It is priced at 2$. If you wish to know where a particular photo was taken then there is no other app better than Koredoko-Exif and GPS Viewer. It is also a free app developed for iOS devices. This app shows the latitude and longitude of the place where the photo was snapped. It also shows the date and time and its place on the map. You can also customize the data accordingly. This app supports the new iPhone X and the few small bugs and glitches that were disturbing the performance of the app; they have been fixed for good. Overall, a great option to go for! A late but proper addition to the list, Exif Eraser is a free app beautifully designed for professional purpose but only supports iOS devices. It can show and remove any kind of personal data within seconds. You can change the metadata and even process more than one photo at a time. You can easily delete chosen photos. Needless to say, it is an exceptional app with an updated library and accurate positioning information. EXIF Studio is another excellent addition to the location finder apps list! The app is able to find the EXIF file, where the metadata are embedded immediately. It is a free app designed to operate only on iOS devices. It is a great app for a professional photographer’s collection. You can view, customize and share the EXIF data. A lot of other details can be added with this app thanks to a rich feature list. The app is compatible with iOS 8 or any later version of iOS. ViewExif, is probably the most renowned iOS app known for showing metadata of photos and videos. You can even view the metadata of other third-party apps. Developed for iOS devices, View Exif is not a free app; you have to pay .99 for it. It can show you the name of the file, the size of the file and even the dimensions of it. You can view Geo-locations on the Apple Map. Provides an extension of Photos App and other third-party apps like Dropbox etc. Last but not the least, the Photos App from Apple is a free tool available for iOS users and even for Mac. This app is famous and for all the right reasons. Firstly, it is a great photo management tool that can transfer data between iOS devices. The overall working formula is very user-friendly and crisp. Finding the location of photos on Photos app is very easy. There are lots of customizable options so as to view the location perfectly. You can also change a lot of information as well. Overall, a great app and a very significant app from the stable of Apple! All of these GPS photo viewer apps are beautifully designed for viewing, editing and even removal of EXIF files from any media files. Although there are official ways to view and edit EXIF files provided by Apple, these third-party apps are more convenient and they provide many other exciting features as well. These apps only support the iOS devices. You can choose any of them or go for each one so as to assess the capabilities better. In case, if you want to transfer Geo-tagged photos from your iOS device then you can use another third-party tool for that purpose, Tenorshare iCareFone. It can transfer the files with a single click and saves them in its original folder inside the hard drive of the new device. Just go to Places folder inside the program after the 1-click photo export option, and you can get the required photos right away. It is also available for both Windows and Mac. Highly recommended!